If you plan on attending this years 6 Annual 5 Bridges event at Lincoln Park Lagoon , please PM if May 19th 2018 is a date that works for you. I will be trying to set a date that works for most of us. There's 5 Anglers on the list so far. It's always a distinct pleasure participating in this well-organized, enjoyable event. I'm looking forward to it. Thanks, Larry! With the first 6 anglers confirming the 19th of May will work into their calendars, the date is set. We are up to 10 anglers for May 19th. Your #12 on the list, thanks again. Only one spot remains, you snooze you lose. And the menu will be decided according to the weather forecast. 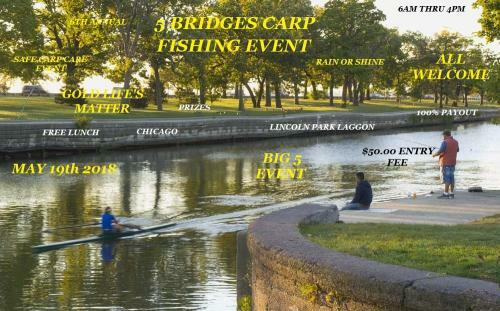 This would be my first carp event of any kind so any info is much appreciated! First of all Dylan, last years winner of this event was a first time carper. He won with all equipment borrowed from me. And with me knowing all the anglers at this event you better be prepared for a lot of fish stories,lol. Any more questions don't be afraid to ask, some on here will gladly help you out. Also, Dylan, you don't need to be a member of CAG to participate. Well then count me in! I doubt I will be as lucky as the last first timer but I'll take beginners luck over skill anyday! Your in! The entry list is full. I will be taking names for the reserve list. Few questions about the event as I have never been near that area. Is there anything I should know not to do in particular? Any special baiting rules? Is it quite a walk from parking to fishing? Also I assume you pay when you get there? Rules will be posted soon. Parking about 50 yards from your peg. Just on the reserve list. I cant promise anything but most of the time 10% of anglers drop out or something comes up between now and then. Josef will be #1 on the reserve list. Thanks Emilio. Entry list as of now.